In the late Spring, Suffolk has few greater delights than cycling around the narrow lanes between Lowestoft and Halesworth. If you avoid the main roads, you wallow in a lost land of scattered farms, little hamlets and mainly round-towered churches. There is hardly ever a car. I was rather more appreciative of this than usual, because I had spent the last four hours cycling around Lowestoft. It was Historic Churches Bike Ride Day 2009, and I had taken the opportunity to rush around the churches of that town, knowing that at other times almost every single one of them was kept locked. It was not necessary for me to visit Gisleham on this day, as we will see, but I could not resist breaking out of the urban noise and into the high-hedged lanes. In spring, the verges are high in wild angelica, its vivid light green found nowhere else in nature. The birds sing, the hedgerows are alive with rosehip and hawthorn flowers, and there's hardly anywhere I'd rather be. But on this late summer day, with a hint of early autumn already in the air, the fields were bare, scoured by the plough and not yet beginning to green. Because the hedgerows still survive around here to a great extent, large vistas are rare, and churches may appear as a surprise, suddenly, around the next bend. An OS map is essential for cycling out here, especially for would-be church visitors, for they are often away from their villages, and sometimes the villages no longer exist. But this is a fine village, despite the march of Lowestoft towards it. Gisleham is pronounced with a hard G, Gizz-lum rather than Guys-lum or Gizzel-ham, both of which might seem more obvious pronounciations to an outsider. It is also not to be confused with Gislingham in mid-Suffolk.The first sight of Holy Trinity is delightful; tree surrounded, across the fields. It had been ten years since I had last visited Gisleham, but I had a very strong memory of that occasion. As a harmless eccentric, I'm used to being followed into churches after about five minutes by suspicious locals, who pretend to be putting up a notice or rearranging the flowers, when clearly they've just come in to keep an eye on me. I'd been pleased to find this lovely church open, and doubly pleased by the wall paintings, of which more in a minute. I was photographing them when a very jolly fellow popped his head around the door. "Halt! ", he cried. "I've come to make sure that you're not stealing anything!" Mr Scollard was one of the churchwardens, a man who clearly loved his church, and who was delighted to talk about it, particularly about its growing congregation. "It was down to single numbers, but we're up to thirty or so now." This is no mean feat for a village church these days, and I told him so. The church is in a benefice with the large parish of Kessingland, as well as the nearby tiny church of Rushmere St Michael, now used only infrequently. The system seemed to be working well for Holy Trinity, which hosted the benefice's quieter, less formal services. Mr Scollard also gave me an amusing rundown of the vicars since the mid-19th century, which the demands of space and the laws of libel forbid me from repeating here. But it was very funny. 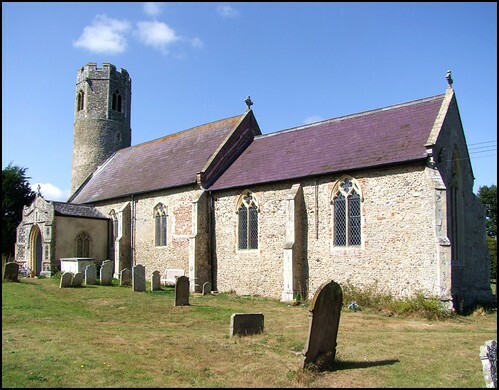 Holy Trinity is one of north east Suffolk's many round-towered churches, and this one is truly a delight, with its late Saxon/early Norman base surmounted by a 15th century octagonal brick crown, similar to those at nearby Mutford and Ashby. Above the porch entrance are the remains of a 15th niche, flanked by censing angels. This was defaced by iconoclasts in the 16th and 17th centuries, but the major damage occured when a sundial, now gone, was fitted in the 18th century, slicing the angels in half. It is a grand, spacious porch, and the door into the nave is most curious, hinged up the middle so that only half of it opens. And it is curious for another reason. Inside, everything is Victorianised, although very well done nonetheless, in a good, vernacular style. The church has large, wide-splayed windows, and the nave and chancel are full of light. The great treasure of the church, as I said, is the wall paintings. These are figures painted in the eastern splays of windows in the north wall. Identifications vary depending on which source you refer to. Mortlock thinks the western one is St Ursula, on the strength of the arrow she carries. But it is not an arrow, it is a scythe, and this is the crowned figure of the East Anglia worker Saint, St Walstan. The easterly one is identified as St Dorothy by Cautley, but Mortlock thinks it is the Annunciation to the Blessed Virgin Mary, and I am sure that he's right. Ten years ago, I'd remarked to Mr Scollard how good it was that the church was open, and how important this was as an act of witness. "Well, we like to keep the church open", he replied. "We think it's important, and it is an act of witness. But the main reason we keep it open is that the door hasn't got a lock on it." And he was right; the lock had been removed at some time in the distant past, possibly during the 1860s restoration, and never replaced. "The insurance company said it was alright, because there's nothing worth stealing", he grinned. And, again, he's right. Everything moveable is locked away, all furniture is bolted securely to the floor. The microdot security system is in operation, allowing any item to be identified. It is safe, secure and sensible, and consequently Holy Trinity can be as welcoming as it is possible for any church to be. Perhaps one day all churches will be like this. After all, it is worth bearing in mind that locked churches are more subject to vandalism than unlocked ones. Holy Trinity is certainly safer like this. There is a grand war memorial in the same style as those at neighbouring Rushmere and Mutford, and a moving little tablet to the two Pugh brothers, who died in a Far Eastern Prisoner of War camp during the Second World War. Their graves lie among the forests of Siam, it notes, but their memorial is the praise we offer in this house - Sursum Corda ('Lift up your hearts'). There is also a late 16th Century brass to Adam Bland of the City of London Esq and Serjeant to Majestye, which is to say Queen Elizabeth I. Ten years ago, I hadn't really appreciated the east window, and I didn't really today. Because of the late afternoon light, it was hard to identify it as anything other than the work of the Kempe workshop, as in fact Mortlock does. It wasn't until I got home and had a look at my photographs that I began to wonder if there was more to it - so much so that I came back the following week to take another look. It struck me that the smaller figures are so much in the style of the work of Ernest Heaseman that perhaps he had at least an influence on the artist here, who may well have worked for the Kempe workshop. On the Bike Ride Day, the nice lady on duty had told me that, sadly, Mr Scollard had died about 18 months previously. But I thought that his cheerful spirit lived on in this pretty and welcoming little church. I shan't leave it so long before going back again.